UPDATED: Fri., Feb. 1, 2019, 5:39 p.m.
PULLMAN – Two Pac-12 teams looking to rebound from discouraging mid-week losses will meet Saturday at Beasley Coliseum. Five teams sit between USC (12-9 overall, 5-3 Pac-12) and Washington State (8-13, 1-7) in the conference standings entering a 4 p.m. showdown at Beasley Coliseum (Pac-12 Networks). While their season trajectories might differ, the Trojans and Cougars also share similar objectives entering their ninth Pac-12 game. On Wednesday, both teams suffered double-digit losses that could be directly linked to sloppy passing and inaccurate shooting. Despite deficiencies elsewhere, WSU and USC, through nonconference and conference play, are still two of the best in the league at putting the ball in the basket, ranking third and fourth in team scoring average – the Cougars at 77 points per game, the Trojans at 76.9. But those averages have tapered since the Pac-12 season opened. The Trojans are averaging 73 ppg (seventh in conference games) and the Cougars are down to 68 (11th). WSU stayed cold against UCLA, scoring 67 points in a 20-point loss to the Bruins that saw the home team shoot 43 percent from the field. USC struggled to operate against the league’s top defense, shooting 40 percent in a 75-62 loss at Washington. The Trojans had won three in a row before dropping Wednesday’s game in Seattle to the only team still unbeaten in Pac-12 games. The Cougars lost their fourth in a row and have now dropped 10 of 11 games. “I’m a coach that’s been at this for a while and I understand young people,” WSU’s Ernie Kent said after the UCLA loss. “Things are not going to come to them overnight, as much as I want them to and I want them to get better quicker. 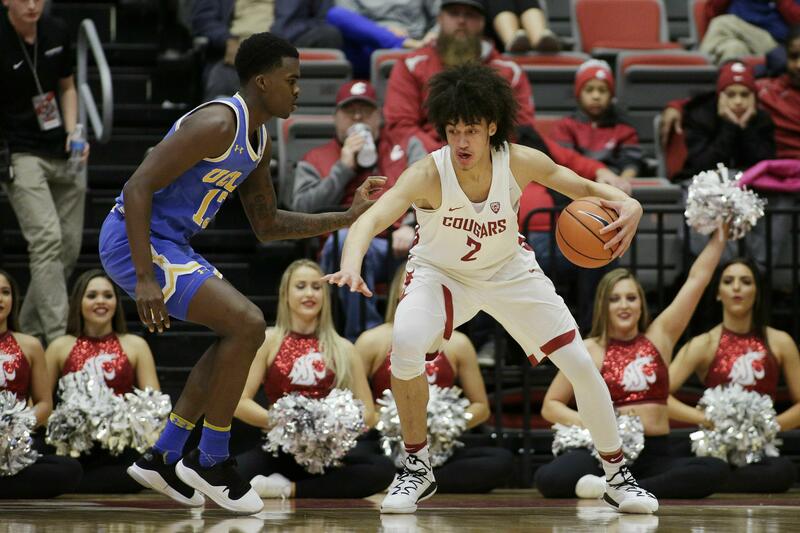 WSU’s Robert Franks (21.2 ppg) and USC’s Bennie Boatwright (17.3 ppg) are two of the league’s top five scorers, but a more intriguing duel might be the one between the Cougars’ CJ Elleby and the Trojans’ Kevin Porter Jr. Both are 6-foot-6 freshmen from Seattle who were former rivals in the highly competitive Metro League. Now Elleby and Porter Jr. are two of the Pac-12’s top rookies, respectively scoring 16 and 9.5 ppg. USC’s Nick Rakocevic could also be a handful for the Cougars. The 6-11 junior forward from Chicago has posted 10 double-doubles this season and is basically averaging one, with 15.8 points and 9.8 rebounds per game. Published: Feb. 1, 2019, 4:06 p.m. Updated: Feb. 1, 2019, 5:39 p.m.